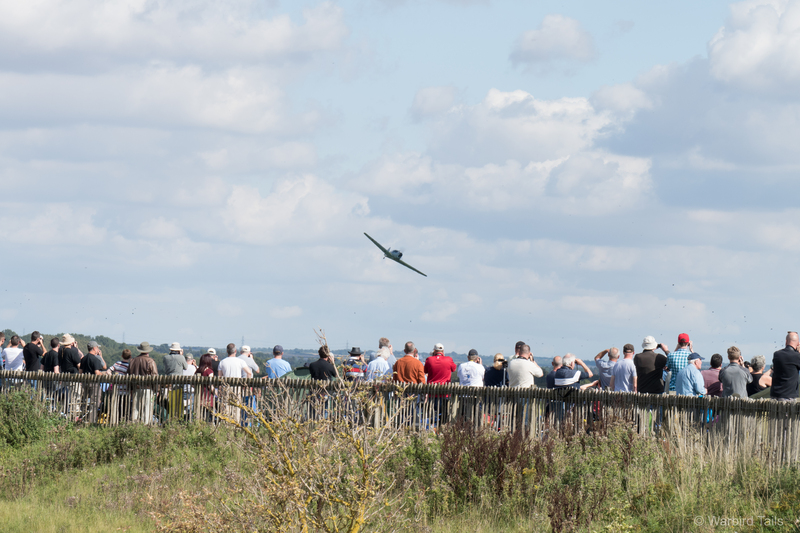 The last major airshow of 2015 came with Duxford’s Battle of Britain anniversary show in late September. Saturday’s show was heavily affected by a road accident on the M11 early on in the flying program. With standstill traffic on the motorway and the attendance of the air ambulance, flying was heavily restricted to 1000 feet minimum for about an hour of the display. Despite this, the show was easily amongst the best of the year. The Buchon pair during their mock airfield attack. The Spitfire Mk I chases the two Buchons around the sky. Both days started with a Luftwaffe attack courtesy of the Buchon pair from the Aircraft Restoration Company and Richard Lake. 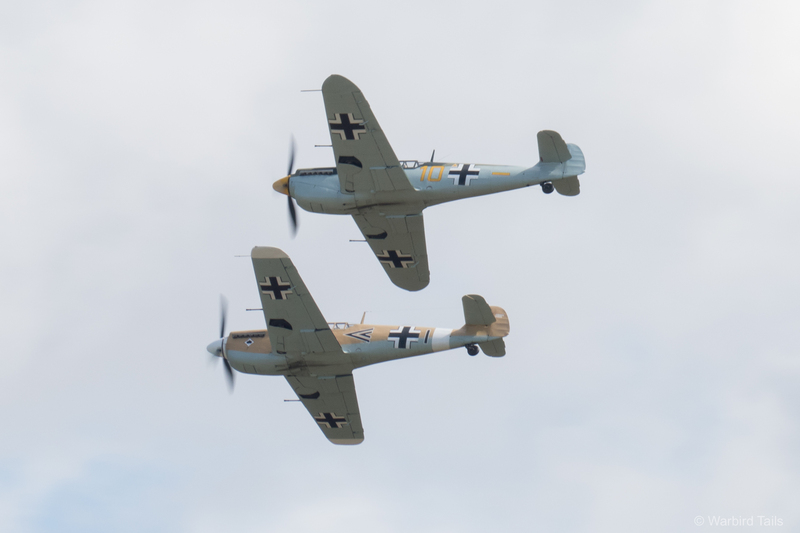 The two fighters performed faultless close formation aerobatics over the airfield while the Nord 1002/ME108 performed low passes over the grass runway beneath them. Before long the RAF were scrambled as Hurricane R4118 and Spitfire N3200 lifted off the grass. The Hurricane performed a low and slow tail chase with the ME108 with some very dramatic sweeping across the airfield. Above this Dave Ratcliffe had caught up with the 109s and followed them through until the inevitable British victory. The 108 sweeps low over the Duxford grass. 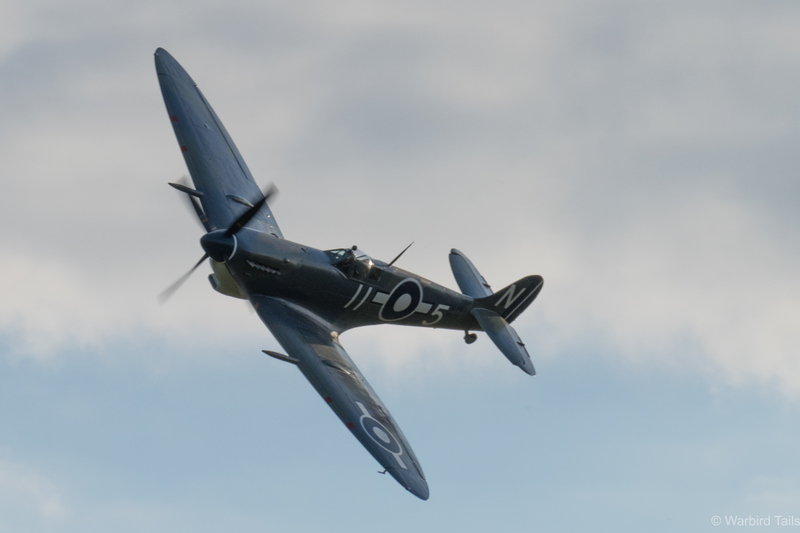 While the downed Luftwaffe recovered we were treated to a sweeping solo routine from Spitfire Mk.1 N3200, this served as a fantastic preview to the Spitfire finale we would be lucky enough to see later on in the day. 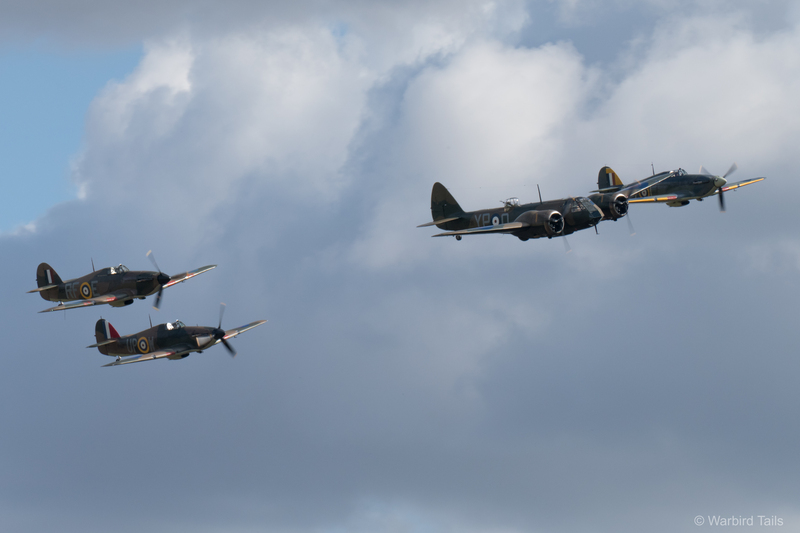 The Battle of Britain theme continued with one of the stars of 2015, the Bristol Blenheim. The Blenheim was joined by three Hawker Hurricanes, with R4118 being joined by the Historic Aircraft Collection and Shuttleworth Collection examples. N3200 climbs out ahead of the solo performance. This four ship performed a few passes together before breaking into two sections. The three Hurricanes peeled off into a tailchase, it was great to see the three Hurricanes performing together as its a rare sight to see more than one Hurricane in the air at the same time. Given that their were 5 examples of the ground it was a shame not to get all of them in the air together; With the ever-growing UK population of airworthy Hurricanes hopefully there may be larger formation displays in the future. The Hurricane three ship running in. 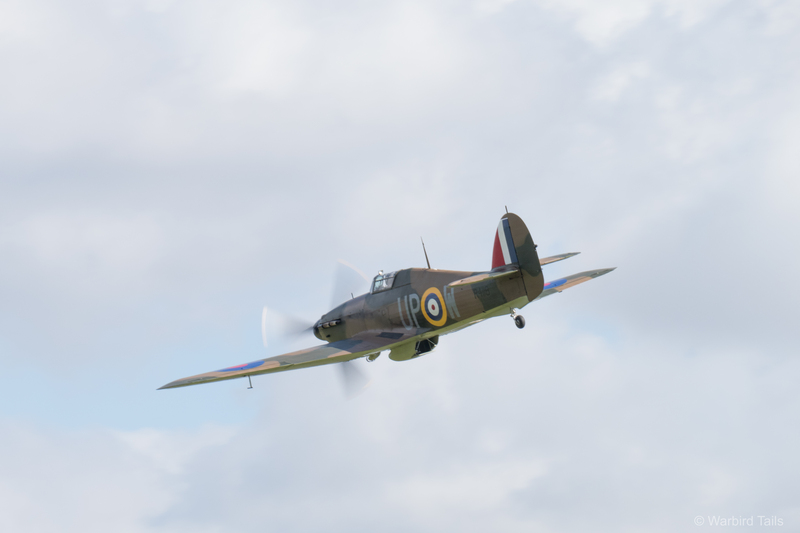 As the Hurricanes positioned into downwind John Romain took to the stage in the Blenheim. Plenty has been written about just how good this combination of pilot and machine is. Its worth mentioning that this show saw a modified display line being used at Duxford. This seemed to have the effect of many acts using the “tank bank” as the display centre. In the case of the Blenheim this made for some impressive and close flying. 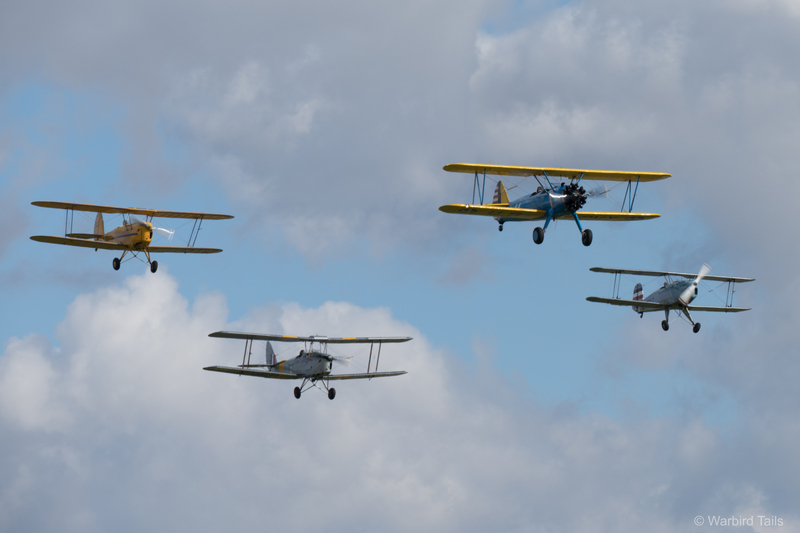 An interesting quartet of trainers brought things down to a more relaxed pace with Tiger Moth, Stearman, Stampe and Bucker Jungman performing in a four ship display. After some formation flying we were treated to some solo aerobatics from the Stampe and Bucker. 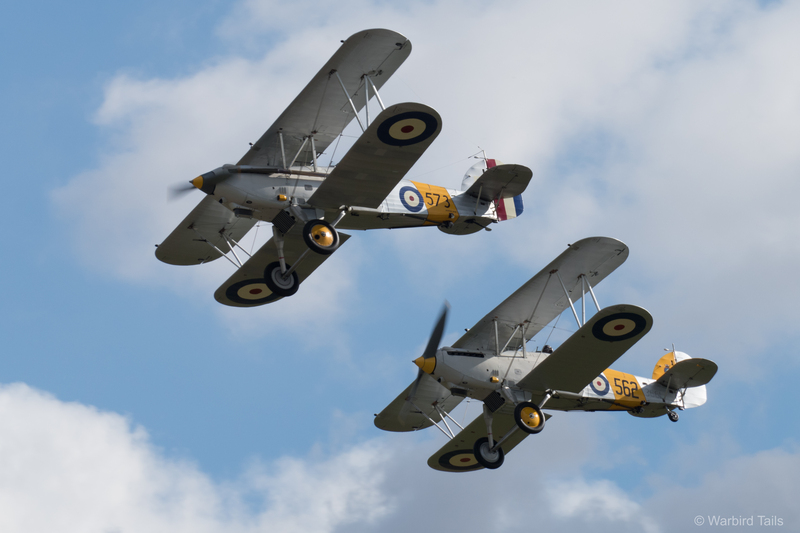 The graceful sight and sound of two Hawker Nimrods. 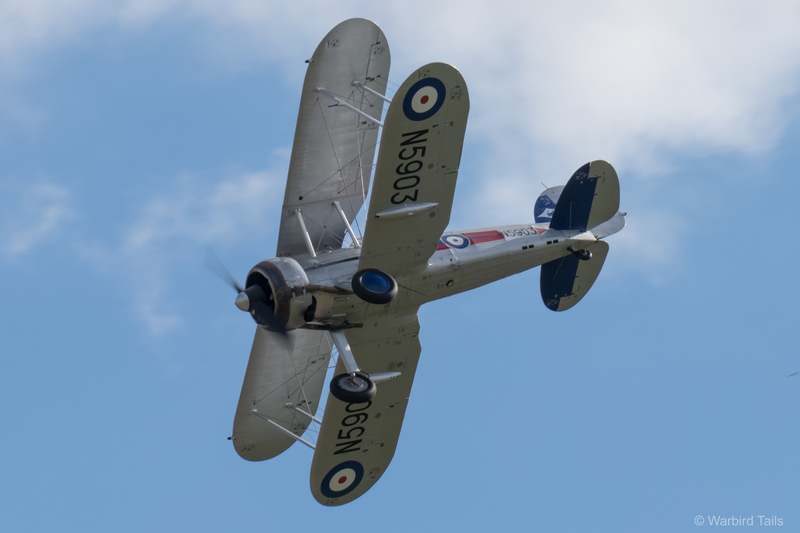 The Bi-Plane theme continued with a rare display from the pair of Hawker Nimrods. 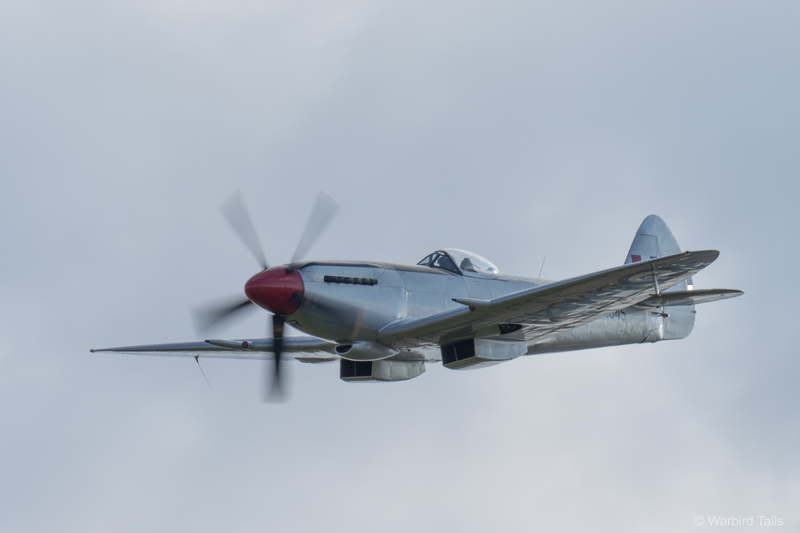 The Fighter Collection’s example has recently had the longer exhaust system fitted and the change in engine note was clearly evident when flying alongside the HAC example. 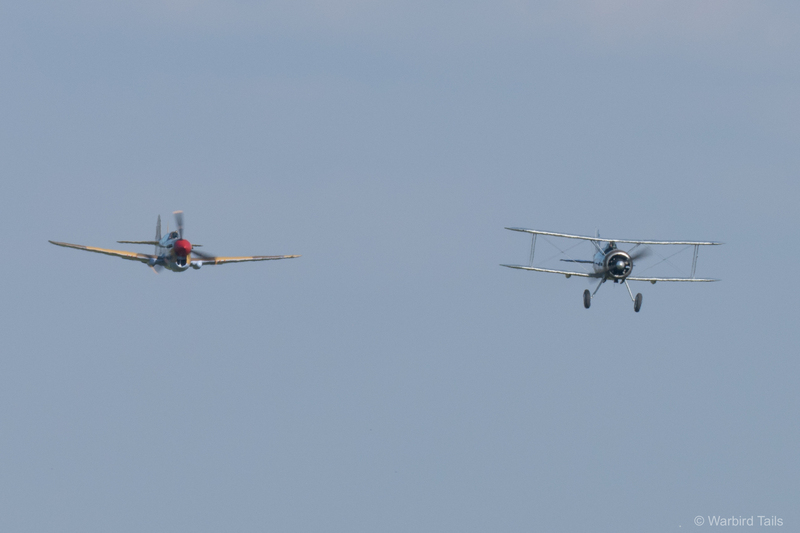 It was wonderful to see these classic Navy fighters performing over Duxford. Perhaps the Fury could join next year? 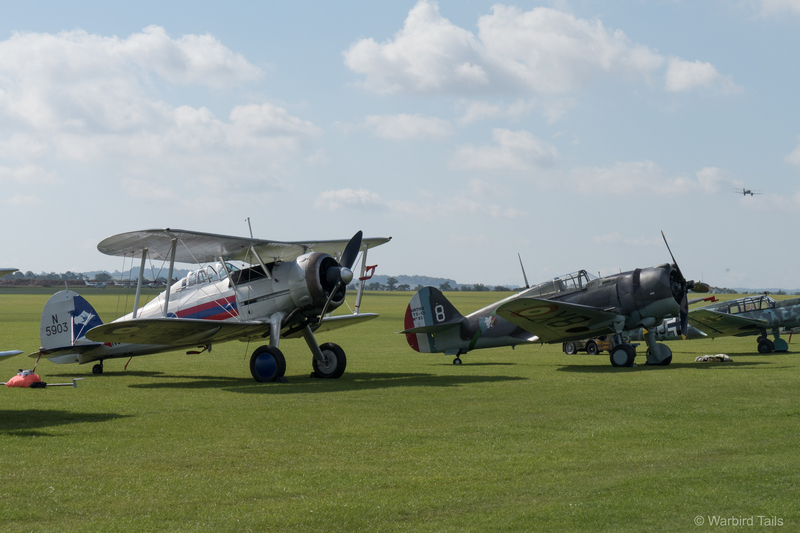 Gladiator and Hawk 75, two classic Battle of France types share the flightline. Next came a real favourite of mine, the Fighter Collection’s Gladiator, always flown in spectacular fashion. This time Pete Kynsey put the fighter through its paces in a spectacular aerobatic display. 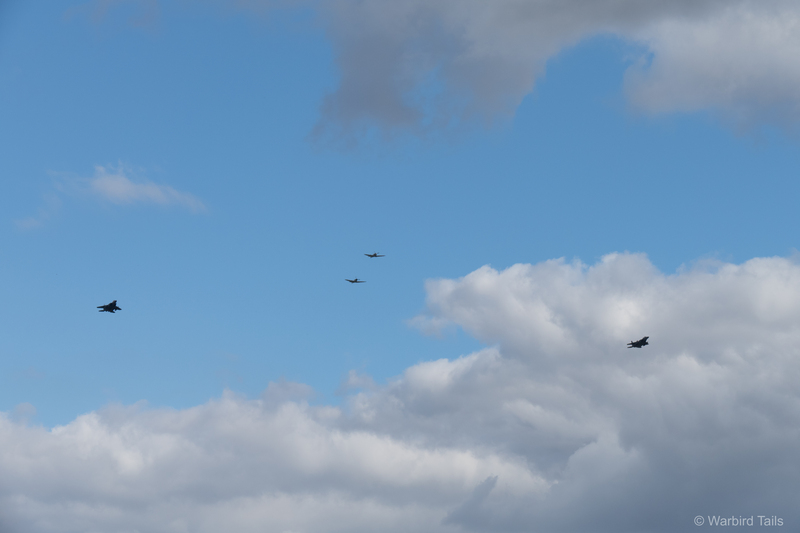 This routine was made even more impressive by running in in formation with the Hawk 75 (P-40F on the Sunday). Seeing this combination of Battle of France types in the air together was fantastic. Pete Kynsey put in a great performance both days in the Fighter Collection Gladiator. The Gladiator was put through plenty of graceful loops and rolls. The Gladiator was joined by the P-40F on the Sunday. The Hawk 75 was unable to perform a solo display on the Saturday due to technical problems, which also kept it on the ground for the Sunday. Luckily The Fighter Collection always have a spare Curtiss Hawk waiting in the wings! The P-40F stepped in on the Sunday performing a graceful aerobatics display in the hands of Alan Wade. 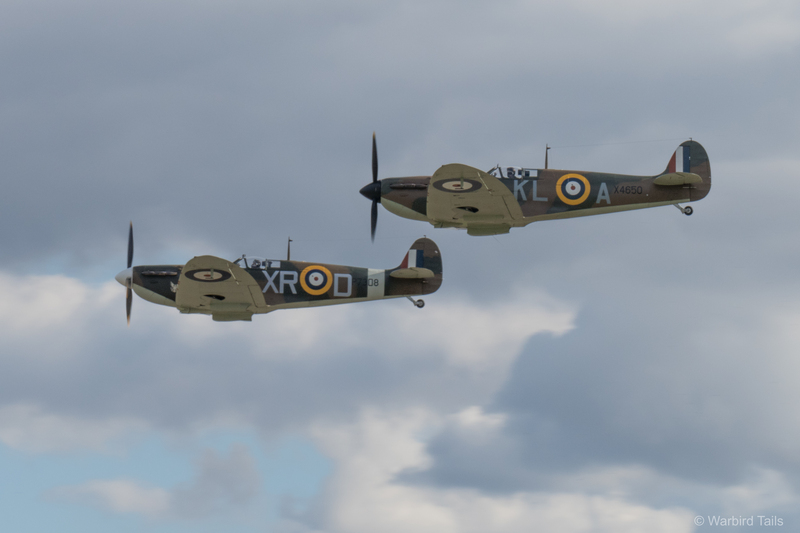 The Commanche fighters Spitfire Mk I pair. Another tribute to the Spitfire came in the shape of the Commanche Fighters pair of MK Is. Piloted by Dan Freidkin and Paul Bonhomme the Spitfires appeared to be glued together as they were flown through a wonderfully graceful close formation display. Easily one of the best formation displays seen for a while. 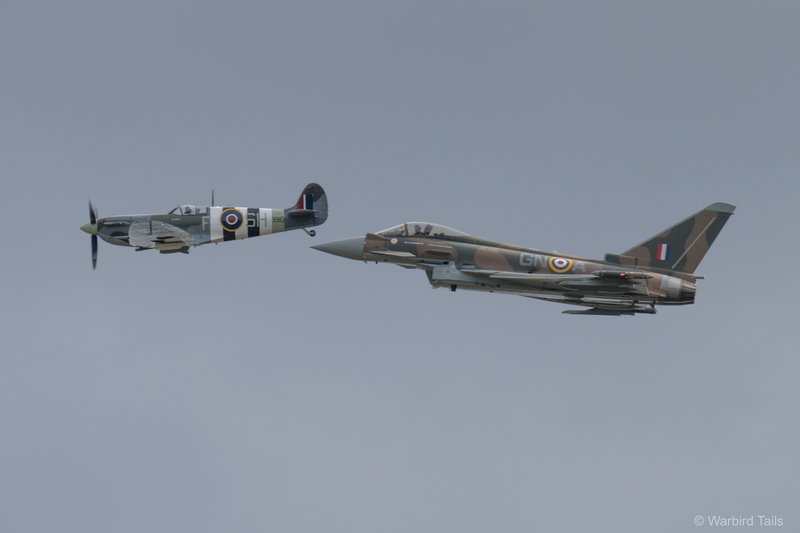 On the Saturday the Spitfire Pair were joined by a pair of F-15 Eagles from Lakenheath. 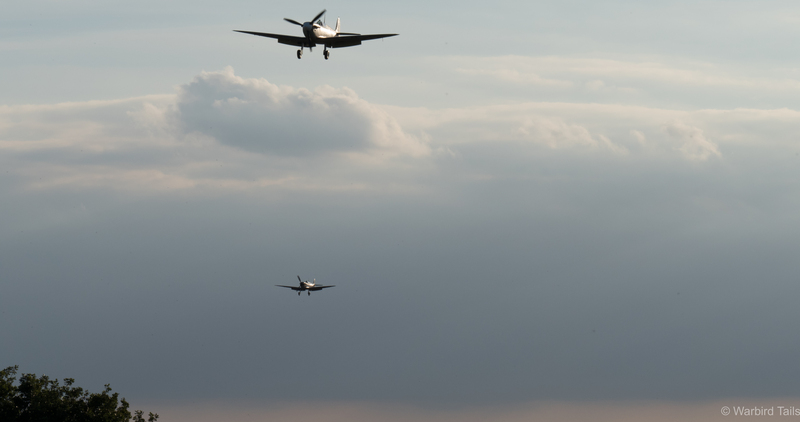 The Spitfires joined two F-15s for a special flypast on the Saturday. 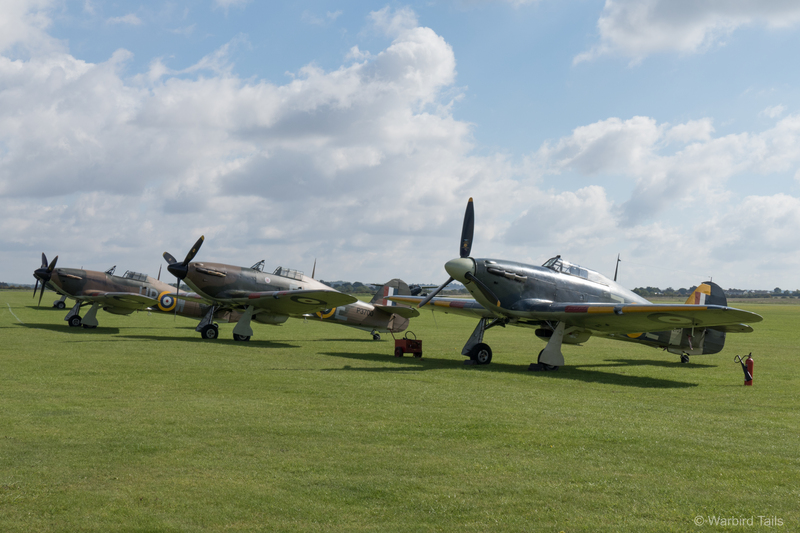 The Battle of Britain Memorial Flight were out in force, fielding their full current airworthy quota of fighters: Four Spitfires (Mk.II, V, IX and XVI) and Two Hurricanes. 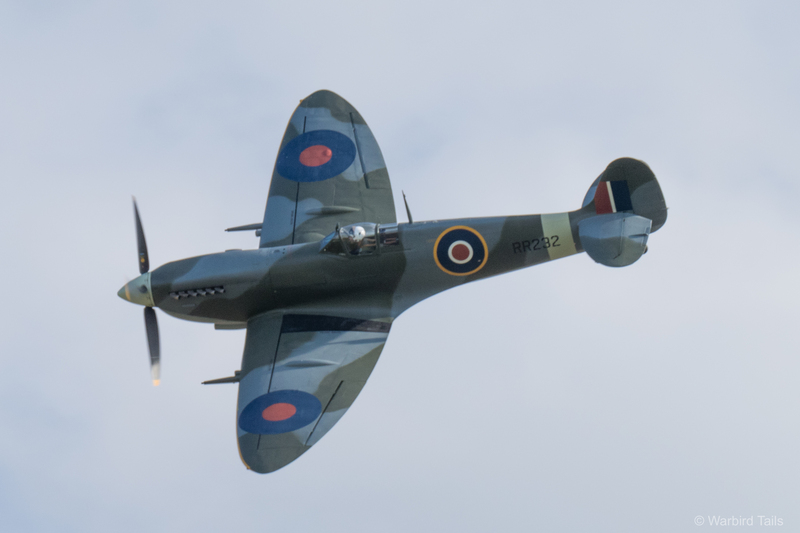 The crowd were treated to plenty of action from the BBMF as they went about other duties on the weekend with arrivals and departures on each morning. 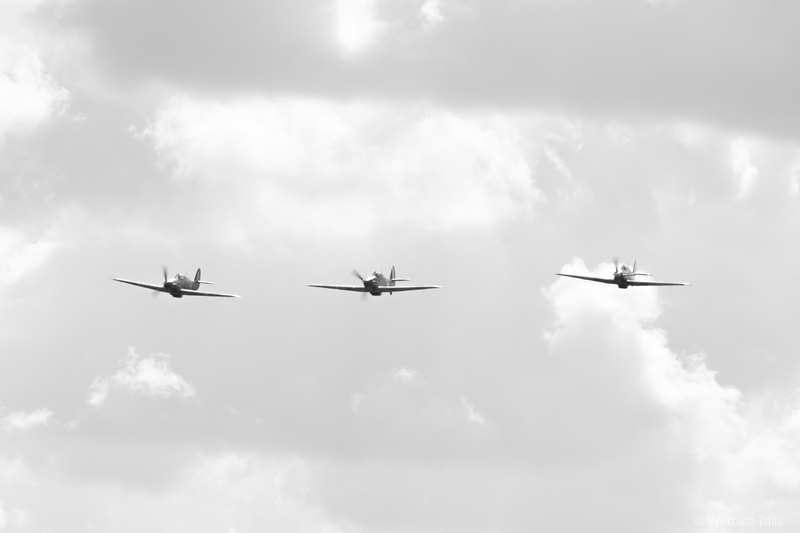 For their main display the fighters joined up in a big wing formation and patrolled the Duxford skies. Saturday served as a high altitude teaser as a result of the restrictions. However the display on Sunday was at a much lower level and the crisp formation flying is up their with the best I have seen from the Memorial Flight. The six fighters formed up with the Red Arrows for a fitting finale flypast on the Sunday as well. 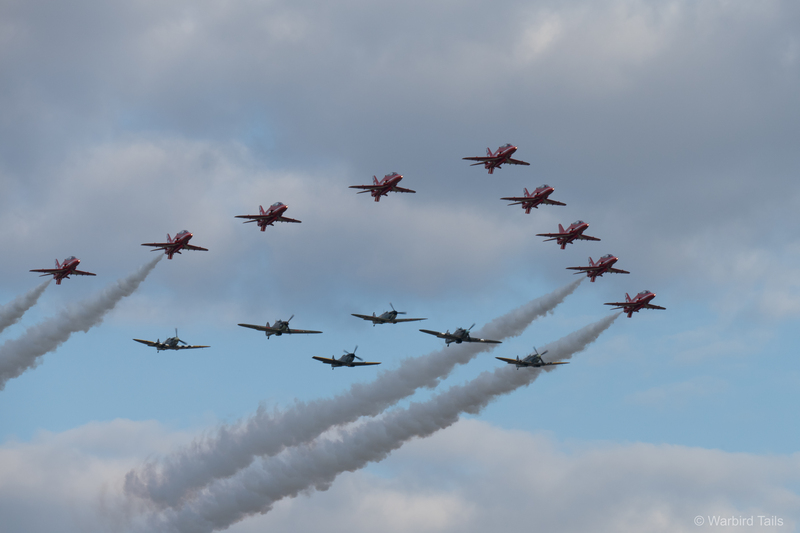 Duxford was also lucky enough to be the last public appearance of the RAF’s Synchro 75 display. Unfortunately they only performed on the Saturday and their slot fell during the airspace restrictions. It is a testament to the pilots however, that rather than performing a single pass as was suggested, they managed to adapt the formation section of the display to the higher altitude allowing the crowd to enjoy the sight of Spitfire and Typhoon in close formation. Smoke On: The BBMF fighters join the Red Arrows during Sunday’s finale. 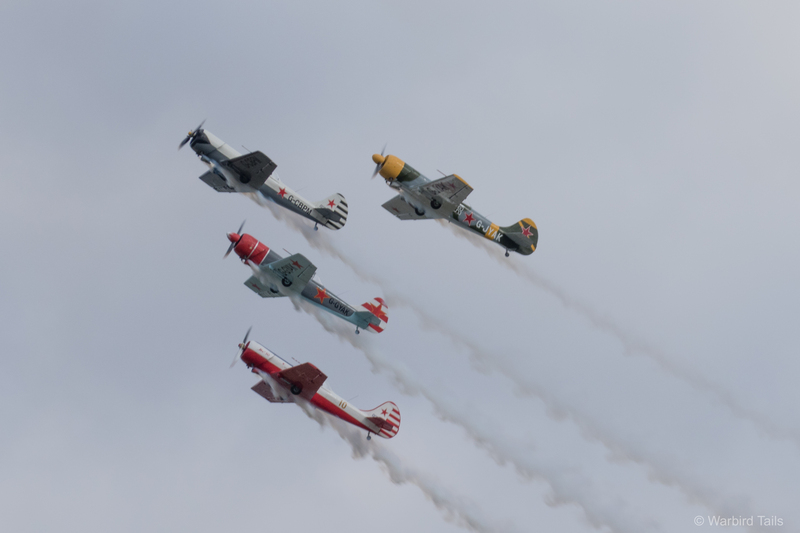 The synchro 75 pair pass by during their last public display of the season. 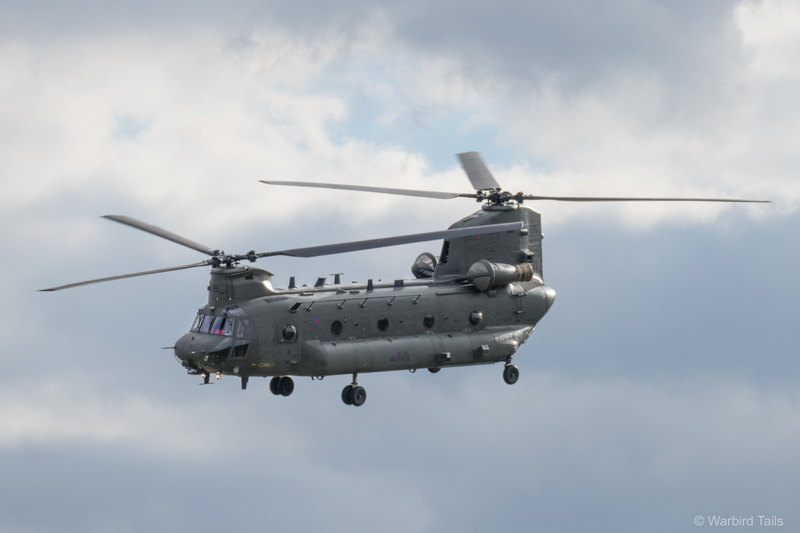 Along with the Red Arrows the RAF also fielded the Chinook display, which is always a remarkable sight and the two performances at Duxford were no exception. The Chinook display never fails to impress. With the Red Arrows only performing on the Sunday of the show, it was left to the Aerostars in their Yak-50s to provide the formation aerobatic entertainment, though performing as a reduced four-ship display this year the team still delivered their high octane display for which they have become renowned. The Aerostars pulling up into a loop. 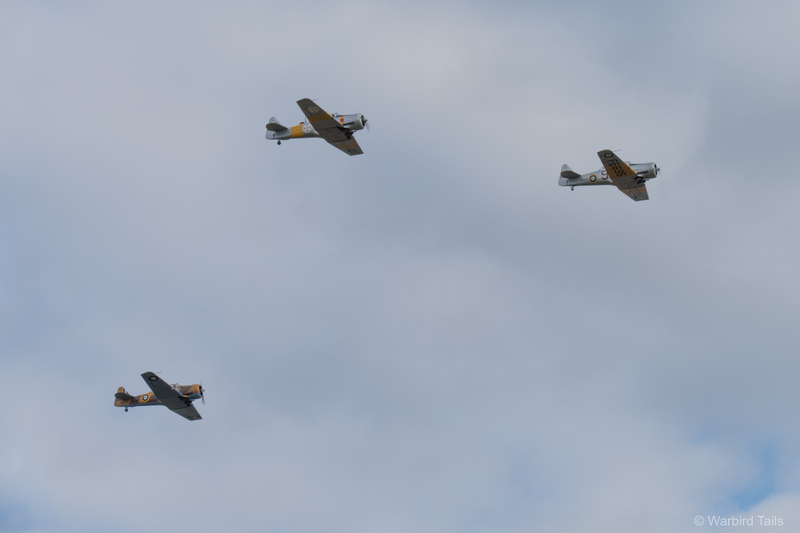 The training theme returned later in the afternoon with a three ship of Harvards, demonstrating the various formation and battle tactics that would have been used during the battle and the remainder of the war. 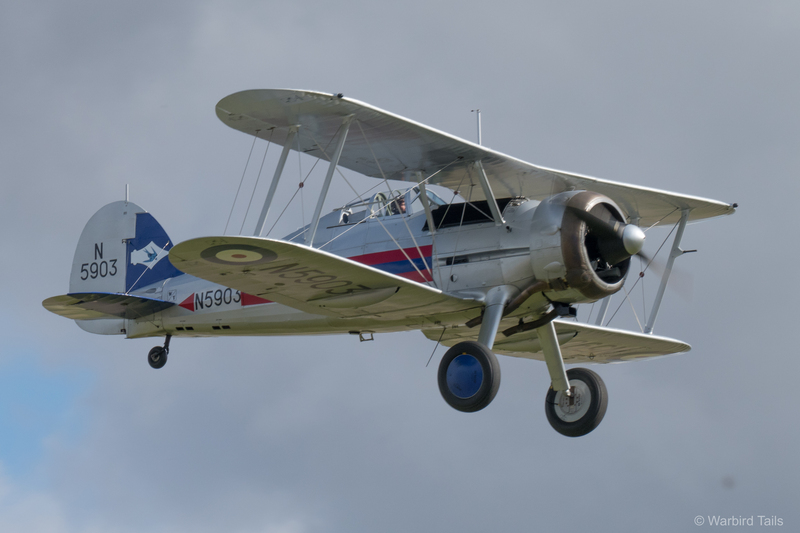 It had been hoped that this years September show would finally see the debut of a long time Duxford resident, the Yale, sadly following a couple of flights earlier in the week the Yale was unable to fly across the weekend. Perhaps next year we can see this interesting type make its first public appearance. The Harvard three shape represented an important part of pilot training in the Battle of Britain. A unique segment came in the shape of the radar testing aircraft tribute. This started with a formation of Hornet Moth, Piper Cub, A Slingsby Kite, Slingsby Petrel and Calidus Auto-Gyro. Certainly not a formation seen before or since I would imagine. 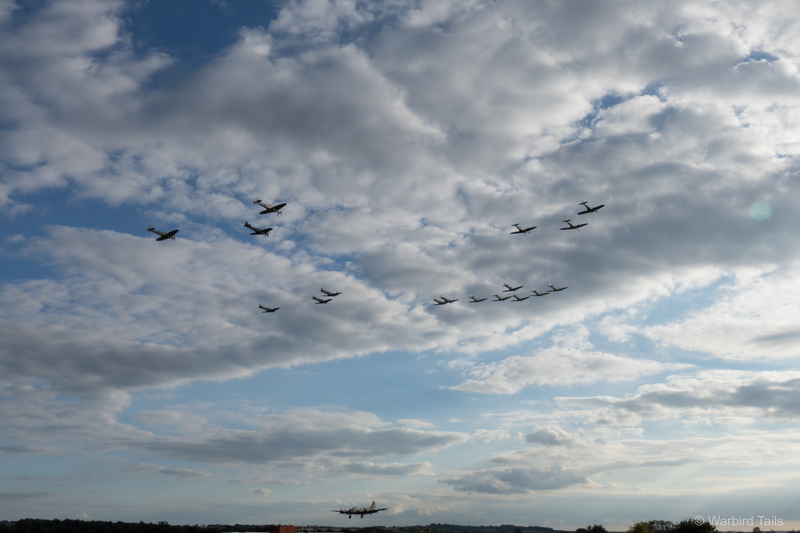 It was a segment with plenty of variety and provided something very different for Duxford while paying a fitting tribute to the important work that went in to developing our crucial Radar system. While the Sunday show concluded with the Red Arrows, Saturday had a more fitting finale in the shape of a Spitfire Spectacular. Brian Smith led 17 Spitfires into the air before leaving the circuit to form up. 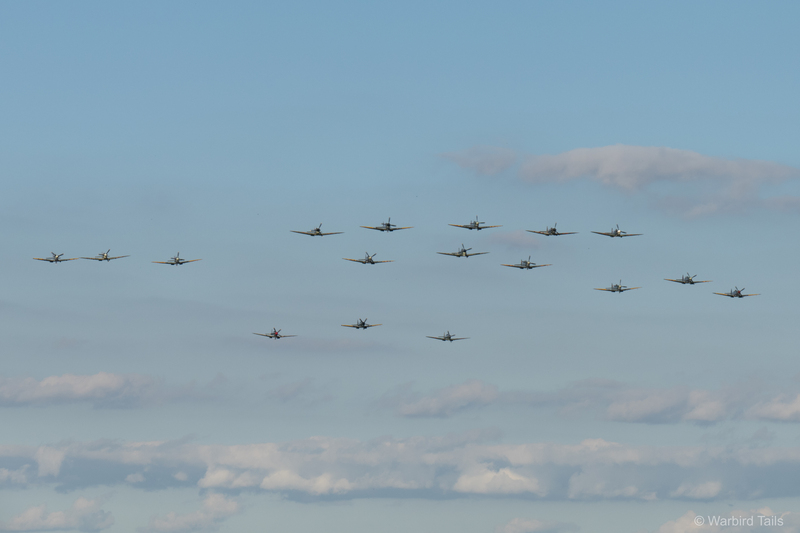 After the earlier events in the year, which saw large ground gatherings of Spitfires but smaller airborne units, it was fitting that it was left to Duxford to provide this mass formation. 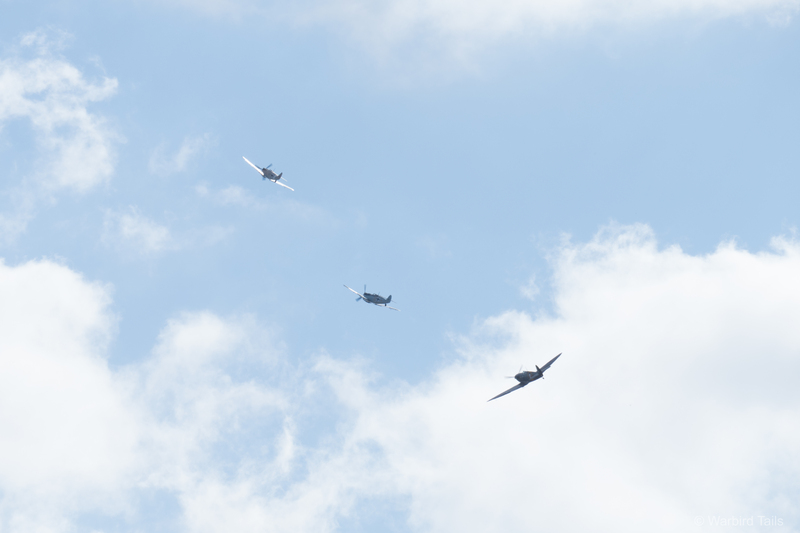 The sound of all of those Merlins and Griffons getting airborne was spectacular. 2015’s celebrations have seen Martin Phillips’ Mk IX RR232 make its first public appearances. The process of getting all those Spitfires formed up obviously took some time, much like at Flying Legends a “Joker” was required on each day as the formation got together. 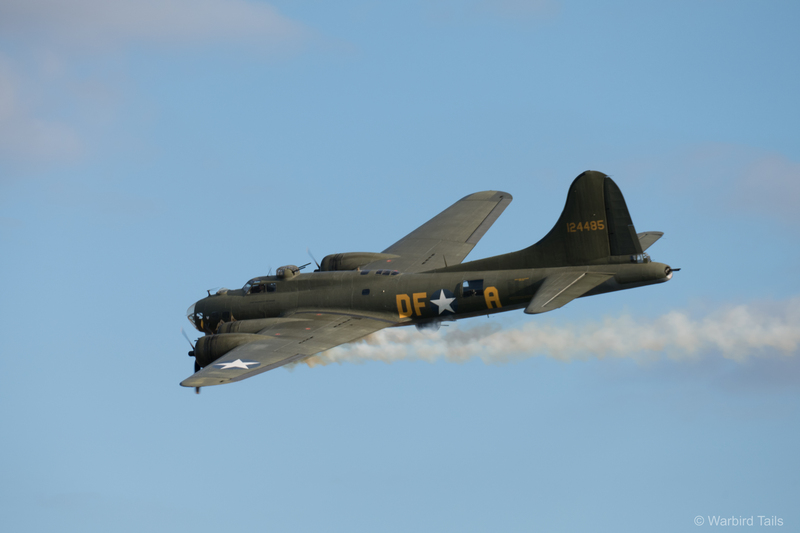 The Saturday show saw Sally B performing this role, soaking in the late afternoon sun and performing a low approach to land under the Spitfires first pass. Sunday’s Joker was a far more appropriate extended solo from Dave Harvey in the Hurricane. Saturday’s “Joker” – B-17 Sally B.
Dave Harvey pulls the Hurricane up into an elegant Barrel Roll during the Sunday Joker routine. Back to the Spitfires though. The first pass of the display on each day was a full formation big wing flypast. 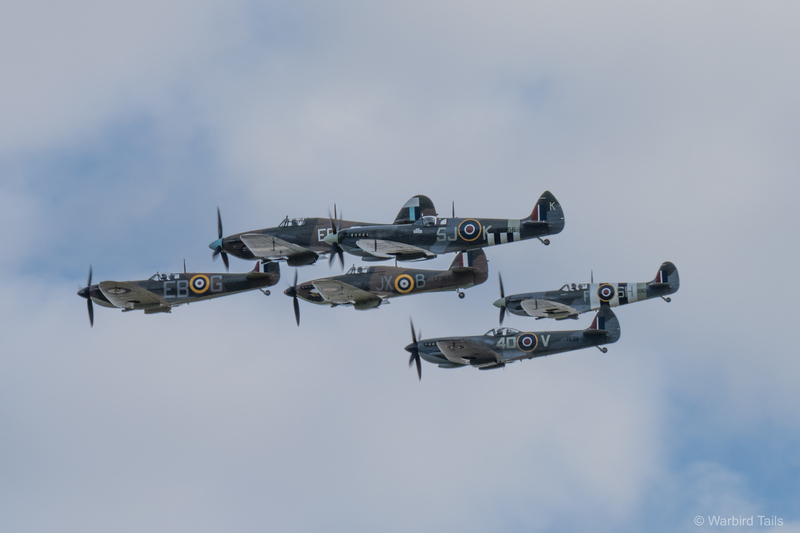 The spectacle and noise as the aircraft passed in front of the crowd was nothing short of magical and amongst the most memorable tributes in this Battle of Britain anniversary year. After a few more passes in increasingly spaced out formations, it was time for one of the best Spitfire tail chases in years. The bulk of the Spitfires performed a figure of eight pattern across the far side of the airfield in two sections, while 5 aircraft performed in a race track pattern down the grass runway. The highlight of this section for me was the leader of the race track section, the Seafire III. 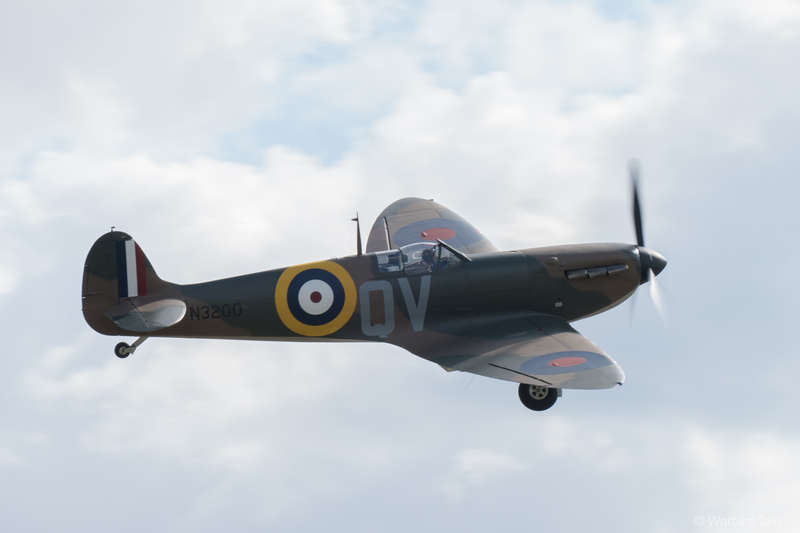 Having seen this machine at Legends, Goodwood and Biggin Hill earlier in the year, it was amazing to see this new restoration so close to the crowd and in perfect conditions as well. The Saturday tailchase seemed to go on and on with countless passes; not knowing where to look, absolute bliss. 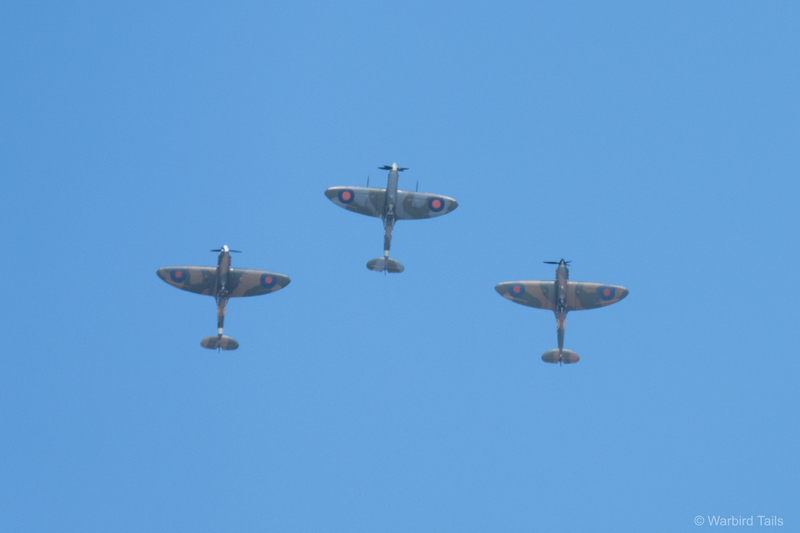 An added element this year was the sight of a looping “Vic” of Spitfires high above, consisting of the Commanche Mk. Is and Brian Smith in MH434. As each tail chase segment split up to land, the sky was eventually cleared for the most fitting of finales. Brian Smith took to the stage for an extended Ray Hanna-esque solo in MH434. As he performed a final sweeping victory roll before landing there was spontaneous applause. 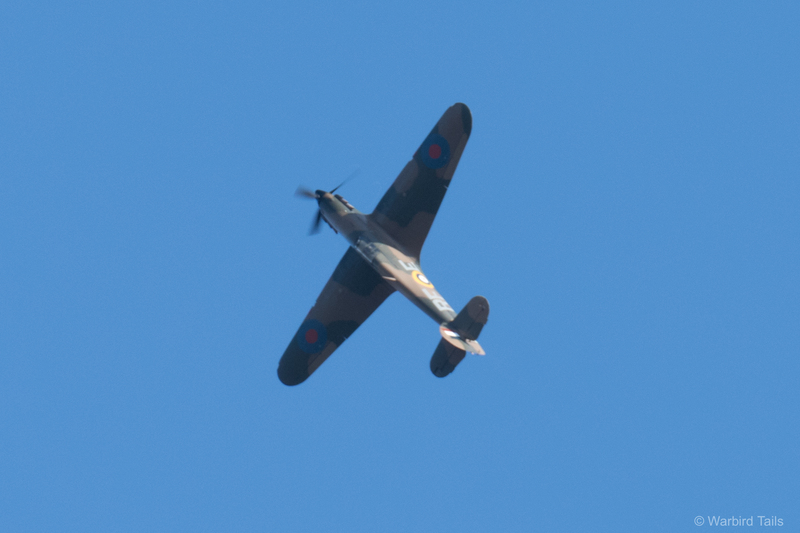 The rest of the show was of course, superb, but that Spitfire finale will go down in airshow folk-lore without a doubt. I never doubted Duxford’s ability to deliver one of the shows of the year with a Battle of Britain theme and they certainly a delivered. 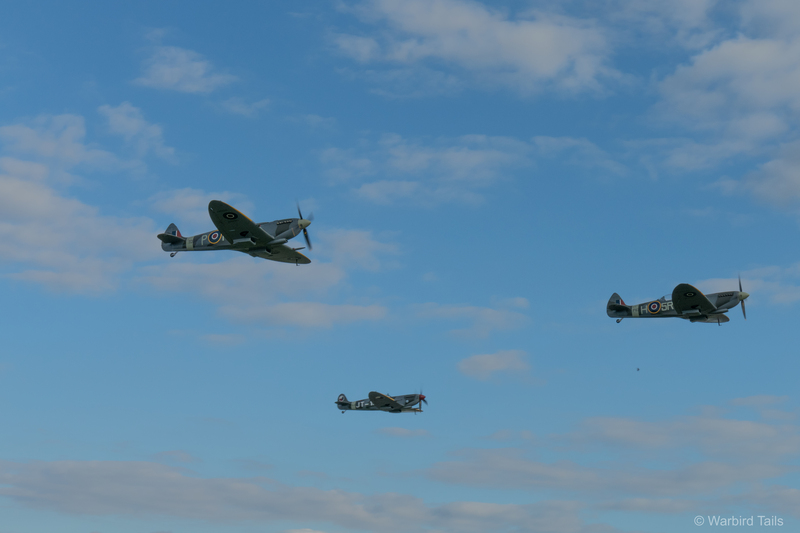 A fine way to end the shows at Duxford for the year.